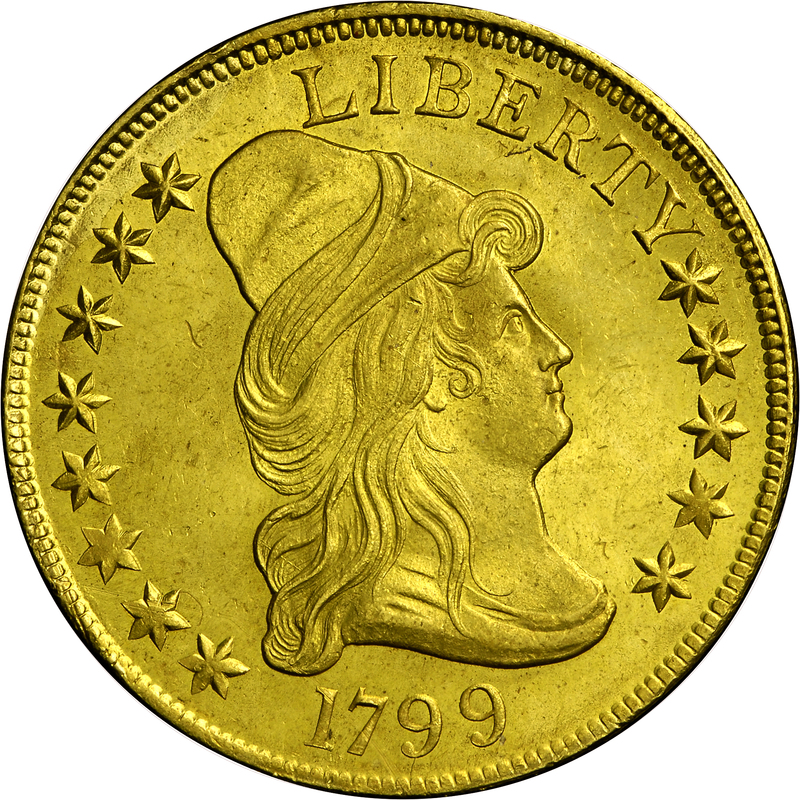 This coin represents a very rare die marriage, with approximately 15 examples known. The Bass Collection coin is among the finest. The obverse die is normally identified by a heavy die crack from the border past the left side of L. This example, however, is from a perfect obverse die. The reverse die is identified by a die chip between the centers of U and N, and is common to four different die marriages. A minor design modification occurred in 1799. 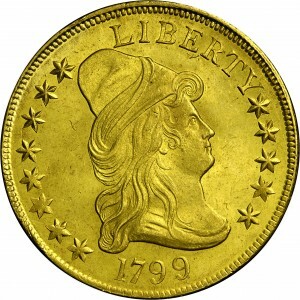 Reverse dies of 1797 and 1798 had seven vertical stripes in the shield while those from 1799 had just six vertical stripes. Purchased from Malcolm Varner, February 29, 1972. 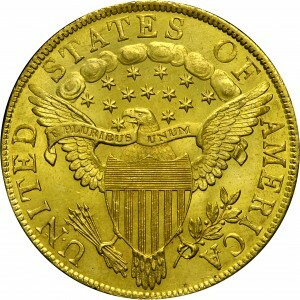 "Obverse: Small stars, wide date, numerals spaced 179 9. Star 8 presents two points quite close to cap, equidistant. Microscopic pointed lump atop T, aligned with left side of T's upright (distinctive). Star 9 well apart from Y. Face and neck speckled with shallow rust lumps. No crack! 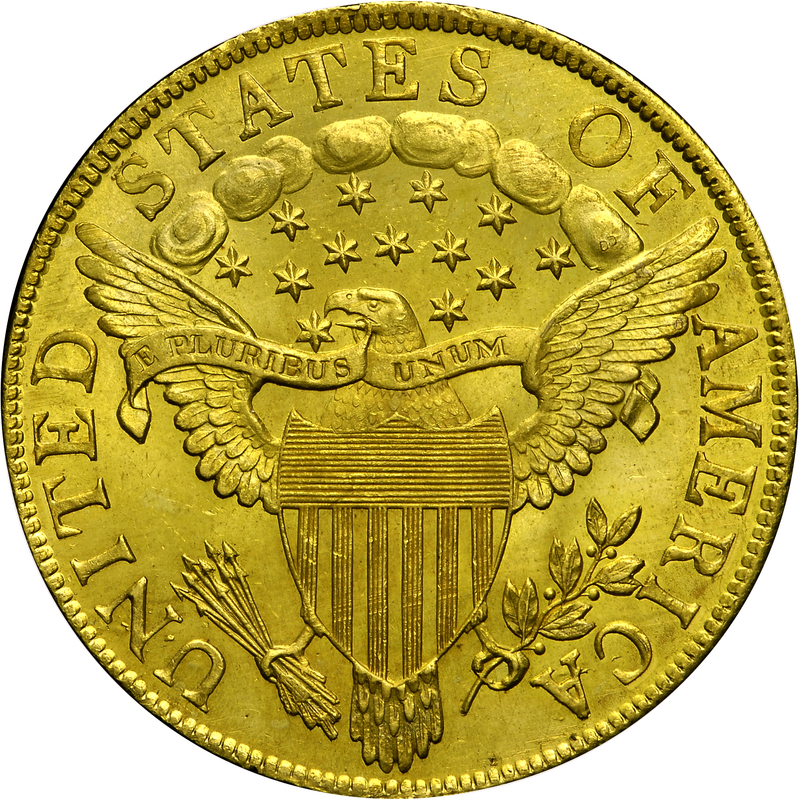 Reverse: Berry centered under A. Leaf point touches I at center of base. A(M) clear of left wing feathers (distinctive). Rust lump between UN, top opening of N. Rust-like crack within C, skips to left side of A, thru A, talon, stem end, tail feathers. Another, faint, edge between O F, thru O, second cloud from right."